Canyoneering is an activity that has been around as long as the canyons. With current technology and information resources, canyoneering can be an adventurous activity for many to enjoy. As a canyoneering enthusiast, I've found it difficult to find one good source of information. How many canyons have I overlooked just because I didn’t know about it? Where can anyone learn about these canyons except by accidentaly stumbling across them in a book, a reference from a friend, or simply treking through the desert and just happening to fall into a rare and beautiful canyon? In an effort to amass a huge database of canyons and information, this site has been created. Let's consolidate our knowledge and resources to create the largest canyoneering website around. Canyoneering uses a mix of active skills: climbing, rope work, spelunking (caving), swimming, river running, rappelling, scrambling, navigation and hiking. We also live in an era of great technology and there is a variety of equipment that can be used to make your canyoneering experience much safer and more enjoyable . 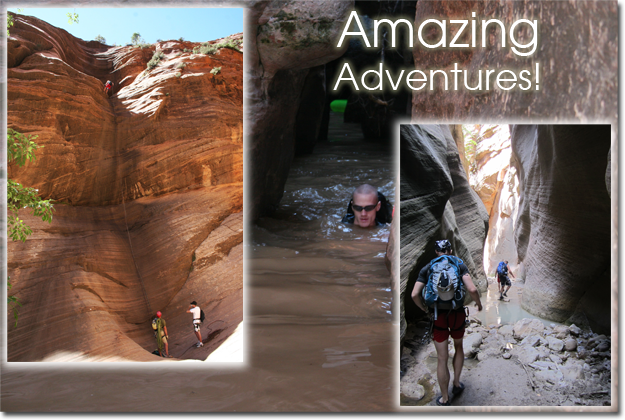 If you are new to canyoneering, note that canyoneering is a extreme sport. You can get seriously injured or even die in some of the more remote and technical canyons if you don't know what you're doing. It is highly recommended that you explore many resources to gain as much knowledge as you can before you embark on this dangerous, yet adventurous and fun activity. This site may be used as a reference, but it in no way has the full route descriptions you may need on your adventures. Within the site are listed many books and references that will help guide you. Please make good use of these resources. Also, it is best to start as a climber and learn rope work and scrambling. A lot of phsyical exertion is required on even basic canyoneering hikes. It's best to attain high levels of fitness before attempting canyoneering. Know your physical limits! Perhaps you can even use our member section to make new friends and help educate yourself along the way.